These home brew kits are MULTIPLE AWARD WINNING HOME BREW KITS, providing the home brewer with a premium selection of all malt home brew beer kits. 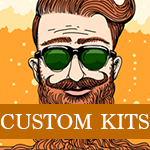 Woodfordes beer kits do not require any additional additives or brewing sugar. Woodfordes top quality home brew beer kits have been developed in conjunction with the Woodfordes brewery using their original grist formulation to accurately emulate the individual character of the Woodfordes commercial beers. The quality of these kits is outstanding, you can produce the real taste of Norfolk with these home brew Ales. Woodfordes has now been brewing beer for over 30 years. They are passionate about using only the very best ingredients in their beers: ancient water from beneath the brewery; Norfolk Barley; and a diverse array of whole hops that gives their beers both flavour and aroma.